(1) How versatile is it? And after getting three reviewers on it in a variety of conditions, we’ve got our answers to those questions. Don’t let the 90mm-width fool you, this is a wider, on-piste carver, not an all-mountain ski. The Z-Line 90 doesn’t feel much like the other Renoun skis we’ve been on (the Endurance 98 and Citadel 106). It has more energy, much more mass, and it really feels and performs like a traditional, directional carving ski — like a wider Head i.Rally. It isn’t quite as smooth as the i.Rally or i.Titan, but the Z-Line 90 initiates turns with more tenacity than those skis, and it gives back a bit more energy. Given its hammer-head shape, we have little interest in skiing it in moguls or off piste (unless that off-piste snow is very smooth, consistent, and carvable). But stick to groomers, and you can push it hard. It’s a ski that will be enjoyed most by those who have decent strength and good to excellent technique. Jonathan Ellsworth on the Renoun Z-Line 90, Taos Ski Valley, NM. Sam Shaheen (5’10”, 140 lbs): This is where the Z-Line 90 shines. It feels damp, predictable, and powerful on fairly smooth groomers. The ski prefers a driving, forward, traditional stance, and I could push it very hard. Another distinct characteristic of the Z-Line 90 is that it feels most comfortable making turns of a fairly particular size (it’s stated sidecut radius is 16 meters for the 180 cm version). Tighter turns and larger turns are certainly possible (short turns took a bit of effort, and longer turns felt a bit squirrely at speed), but under my feet, the Z-Line 90 felt like it was most comfortable cranking out medium-radius turns at moderate to high speeds. Luke Koppa (5’8”, 155 lbs): Yep, I’m in full agreement with Sam. The Z-Line 90 feels pretty smooth and predictable on groomers, and it’s most comfortable sticking to medium-radius turns (not Slalom, not Giant Slalom). And the upside to its shape is that, as soon as I laid it over, it would pull me into a turn in a very intuitive and predictable way. So I wouldn’t recommend the Z-Line 90 to skiers who love to bend their skis into really tight turns — I could drive the Z-Line very hard, but I never felt like I was bending it enough to force it into much tighter turns. But because I could basically push it as hard as I wanted without it folding up at all, I felt very confident skiing fast and hard on the Z-Line 90 on groomers. Jonathan Ellsworth (5’10”, 180 lbs): I’m too impatient and / or lazy to make a bunch of fast, tight, high-energy, slalom turns down a groomer of any appreciable length, so the fact that the Z-Line 90 isn’t a slalom ski doesn’t bother me in the least. But I’d agree with Sam and Luke in saying that this is not a slalom ski, so look elsewhere if that’s what you are really into. But the Z-Line 90 is a really nice carver, and I would primarily want to underscore Luke’s point about just how easy it is to get this ski on edge and tracking hard. And in that sense (using this ski specifically for carving up groomers — or to get more comfortable carving up groomers), I think this is a ski that experts will really appreciate. 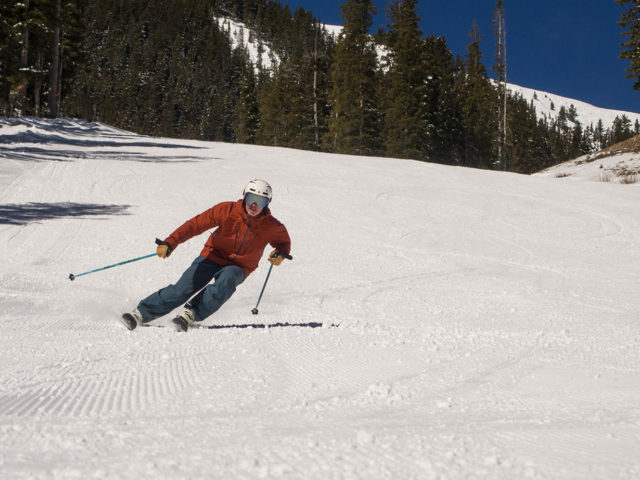 However, I think low-intermediate skiers who are interested in a ski that will encourage them to engage their edges and get more and more comfortable riding the radius of the ski through carved arcs will benefit from it, too. Sam: The Z-Line 90 felt comfortable at high speeds, but it wasn’t quite as stable at really high speeds compared to a couple other skis in this class. That said, if you keep the Z-Line 90 on edge and stick to the medium-radius turns it prefers, I think that many / most skiers won’t hit the speed limit of the ski. And again, cranking out hard turns on the Z-Line 90 is a blast. When making longer turns, the Z-Line 90 lost a bit of its composure and didn’t track quite as well as some of the heavier skis in this category. Sam: The Z-Line 90 produces more pop / energy than several skis in the category, including the Head SuperShape i.Rally and i.Titan, and the Liberty V76. I wouldn’t call the Z-Line 90 a super snappy ski, but it has a decent and predictable amount of energy when coming out of a turn. Jonathan: Yep, I think “predictable” is the key word. In terms of rebound, the ski does not feel “dead” to me. Nor does it feel spring loaded, like it wanted to launch me far across the fall line with each turn. Predictable. Sam: As I noted earlier, the Z-Line 90 feels most comfortable while making medium-radius turns on edge. As a result, sliding tight turns through trees and bumps isn’t where this ski shines. The Z-Line 90 is a fairly demanding and powerful ski with a “hammerhead” tip shape, which isn’t what I look for when grabbing a ski for bumps or trees. So if true all-mountain performance is what you’re seeking, we’d recommend a ski with a bit more tip taper and / or rocker. That said, I think the Z-Line 90’s performance in tight spaces is much better than many other carving-oriented skis with similar shapes. Luke: I really liked the Z-Line 90 on groomers, but in moguls its wide tips, moderately heavy weight, and stiff tail felt like they were fighting me. The tips felt fairly heavy when trying to swing them around, and the pretty stout, flat tail was not very forgiving of mistakes when I got backseat. Sam: Though I didn’t get to ski the Z-Line 90 in much softer snow, I think most of the sentiment I have about this ski in bumps and trees will translate here. The Z-Line 90 is wider than most carving-oriented skis on the market, and that extra width will certainly help in soft snow. But if off-piste performance is a priority for you, I’d look at skis like the Blizzard Brahma or Volkl Mantra M5. Luke: Yep, agreed. When taking the Z-Line 90 through grabby, off-piste snow, its wide tips and fairly tight sidecut seemed to get caught up in random patches of snow. As we keep saying, this ski feels most at home when the snow is fairly smooth and consistent. But that said, the Z-Line 90 did feel more predictable in off-piste snow compared to several narrower skis with similar shapes (i.e., wide tips and tails, lots of sidecut). And I think that’s the main benefit of the Z-Line 90’s wider width. Those who want a pretty tenacious carver like the 18/19 Head Monster 88 Ti, but who don’t want a ski that’s quite that stiff or quite that heavy. 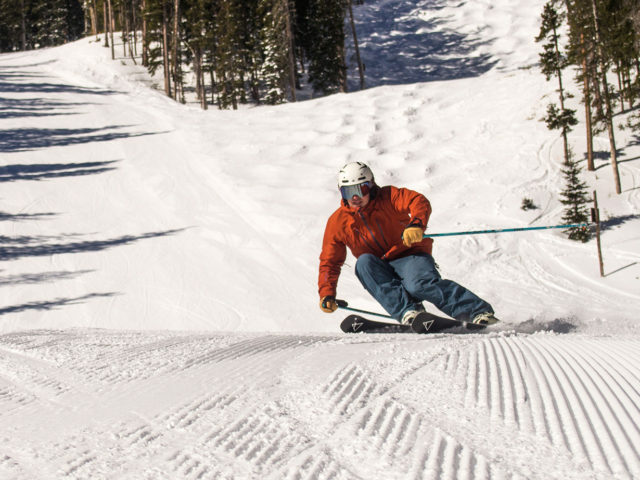 The strength of the Renoun Z-Line 90 isn’t its versatility, but rather, its excellent performance carving up groomers. It offers a good degree of stability without being extremely heavy, and it is damp yet still offers a bit of energy and pop when coming out of a turn. So it is possible to find snappier carvers, and it is possible to find more dedicated GS skis. But all three of us liked the feel and performance characteristics of this wider carver. Become a Blister Member or Deep Dive subscriber to get access to our upcoming Deep Dive on the Z-Line 90, where we’ll directly compare it to the Head Supershape i.Titan & Monster 88 Ti, Liberty V92, Salomon XDR 88 Ti, Blizzard Brahma, K2 Ikonic 84 Ti, and the Renoun Endurance 98 & Citadel 106.